Lithuanian Photography Season comes to an end this month in Scotland with a small foyer exhibition at Glasgow’s 103 Trongate of Romualdas Rakauskas, Romualdas Pozerskis, Gintaras Cesonis, Darius Kuzmickas and Petras Saulenas. The prints on display are a selection taken from 2013’s exhibitions at the Harbour Arts Centre in Irvine, one dealing with the tradition of black and white street photography and the other with pinhole photography. These more comprehensive endeavours were curated by Street Level Photographs who have mounted several other key exhibitions as part of the season and, last year, marked 20 years since their pioneering exhibition of Baltic Photography from Lithuania, Latvia and Estonia, the first UK exhibition to focus on the region. Although the season was kick-started to coincide with Lithuania’s Presidency of the European Union, its timing is, well, timely. As Lithuania grows into its own relatively recent post-Soviet independent skin (watching the recent events in Ukraine makes you realise the potential precarity of this situation), Scotland also stands on the edge of its own potential independence. All the photographers on display here lived through that moment in their country’s history and it is hard not to see the differing styles of humanist black and white documentary genre against the more experimental pinhole art photography without that historical lens. Nor reductive, I would say, to consider the two exhibitions originally staged at Irvine as the old Lithuanian canon vs. the new. This modest display deals with the complex situation of the student gradually becoming the teacher to the next generation, one that enjoys a greater freedom, especially in the creative act. 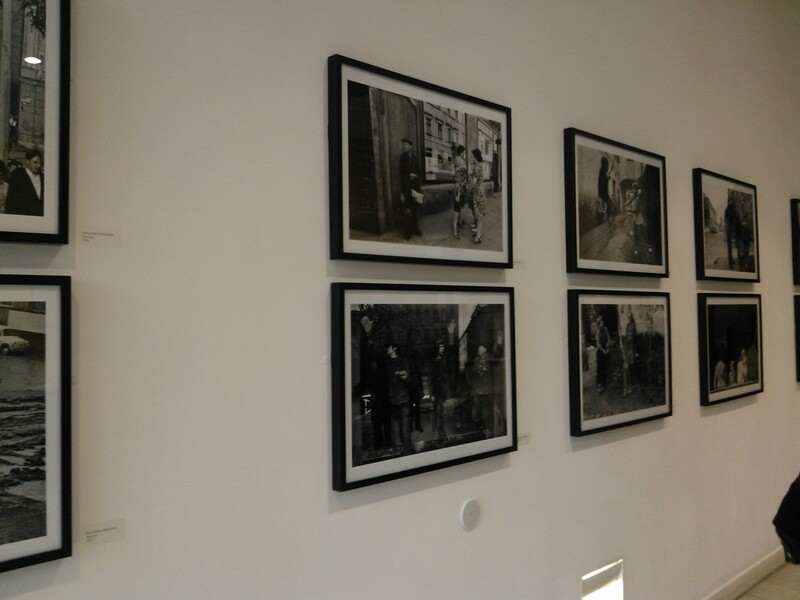 The larger selection at Trongate comes from the Kaunas Street Photography exhibition. All three photographers originally part of the Irvine show are represented; Rakauskas, Pozerskis and Cesonis – each a prominent figure within the Lithuanian humanist tradition. All based in Kaunas, the second largest city in Lithuania, their work focuses on the people in the streets and towns from the early 1960’s to 80’s. Vilnius street scenes are shown in sultry New York style, their dark figured inhabitants in shadow. Men and women are caught in conversation with the background of trolley-buses, others glimpsed lost in their own thoughts as they accidently pass into frame (Rakauskis). Cesonis prefers the lone figure – the old figure waiting at the level-crossing, the young boy peering around the corner of the café gazing at the church - white and lovely in sunlight. My favourite comes from Pozerskis - an image of a heartbreakingly attractive child couple courting each other by a cottage gate in Klaipeda. They are probably never in their lives so perfect as they are here but it is as much about their situation. The twee coastal prettiness of the spit is both modern Lithuania but somehow remote from it – the natural environment of forests and dunes a million miles away from the scruff and narrow alleyed claustrophobia of the cities. Some of the prints are available to buy from the SLP shop during the exhibition and if I had had a spare £75 I would have bought this Pozerskis in an instant. I too am a sucker for the chocolate box romantic Europe. LT Pinhole’s selection, which is radically smaller than that afforded to Kaunas Street Photography, explores camera-less photography, a process both ancient and modern and one favoured by artists of a younger generation. Two photographers (of the five from the original Irvine exhibition) have been chosen for this display - Kuzmickas and Saulenas. The work from both deals with collaged and constructed image making rather than capturing a single moment. 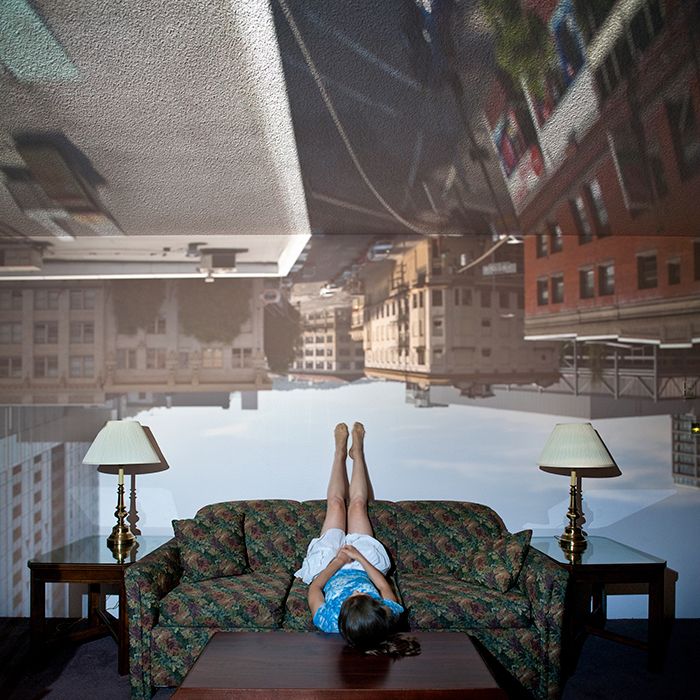 Domestic scenes inside houses and apartments often have girls sitting, contemplating the overlaid cityscapes above or sleeping, projecting dreams in the colour prints from Kusmickas. Preferring black and white, Saulenas overlays landscapes and street-scenes fan-like across the photographic plane in a whimsical style, offering the viewer little windows into the worlds shown within. The circular shape of these individual images reveals the pin-hole hole – like anonymous postcards they give no indications of narrative and become fleeting thoughts revealing a fleeting whole. It would have been good to see more from LT Pinhole, especially if you missed the larger exhibitions in Irvine – the artists works feels like a bit of an afterthought in comparison to that of Kaunas Street Photography. I would also have liked to have seen some female inclusion (there are two short leaflet essays from Agnė Narušytė and Egle Deltuvaite) but I am being unfair and expecting too much from such a small, foyer based display. The exhibition is like a retrospective teaser and hopefully will draw audience back to the previous iterations. A visit to Street Level Photography's new exhibition of Helga Paris is very much recommended and after looking around both I would recommend going next door to the Russian Cultural Centre for coffee, cake and some hot Riga Balsam to recreate a truly Lithuanian experience. I know Riga is in Latvia but believe me, if you ever find yourself in the middle of a Lithuanian forest near to the border with Russia, snow outside on the lagoon and the elusive moose nearby – it will totally make sense.